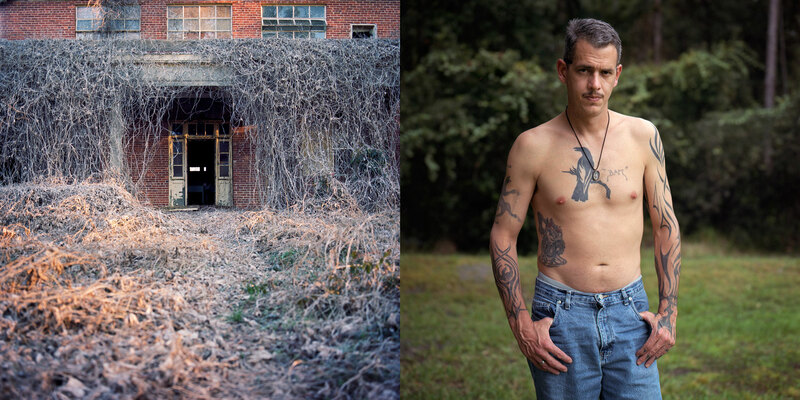 Left: Vines envelop the exterior of a crumbling dormitory at the Arthur G. Dozier School for Boys. Right: “Marianna left scar tissue,” says Aaron Burns, who was sent to the Dozier School for Boys at age 15. “It was a place where you were made to feel like you were worthless.” The tattoos now covering his torso and arms are testament to a life spent in and out of prison.